Roger Hanschel approaches classical music from another angle. What may initially appear as constant or slowly changing repetitions of patterns in unusual metres - offering the platform for lyrical excursions, expressive outbursts or virtuoso escapades, often but not always by the saxophone - reveals itself to be a metamorphosis of classical forms of composition in an unaccustomed environment, of themes that wander through the instrumental parts and much more. Indian music emerges, sequences of tones that sound Ottoman, minimal music, jazz in all forms and variations and indeed, 'classical music' - but honestly, what does 'classical' mean today? A clich� by which each person understands something different. Reason enough, then, to follow the Auryn Quartet's need to do something different in between. Incidentally, the Auryn Quartet embarks on such excursions from its ancestral 'conventional' world time and time again. 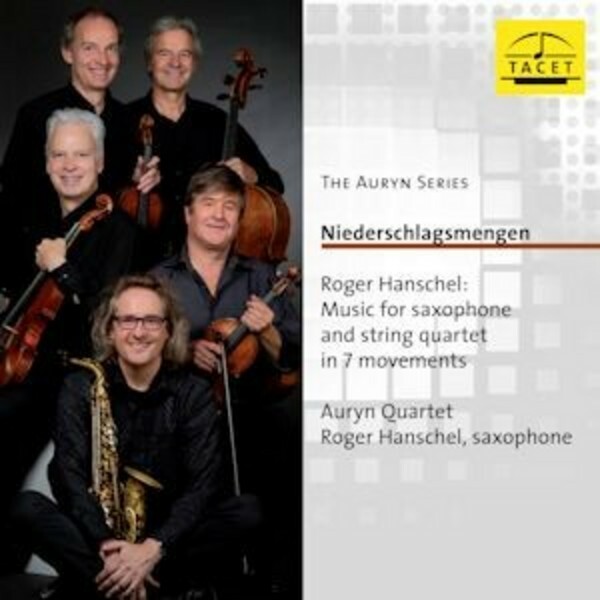 Here, they offer the well-known Cologne 'Saxophone Mafioso' Roger Hanschel an opportunity to show his mastership in both composition and improvisation.